Indomitable | The online home of Chauncey DeVega: Politics is Fundamentally About the Manipulation of Emotion: From the Movie 'Cloud Atlas' to the Comic Book Series 'Elephantmen', What Works of Art Are Guaranteed to Reduce You to Tears? Politics is Fundamentally About the Manipulation of Emotion: From the Movie 'Cloud Atlas' to the Comic Book Series 'Elephantmen', What Works of Art Are Guaranteed to Reduce You to Tears? I hope that you have recovered from your Labor Day sloth, indulgence, greed, gluttony and general decadence. I have a post on ISIS and its terror strategy to share later today/tomorrow. Circumstances have moved me to ask another question. The good folks who sent me to Chicago Comic Con also provided me the opportunity to buy some graphic novels and comic books that were one on my quite long reading list (I finally picked up Saga, East of West, and Manifest Destiny). 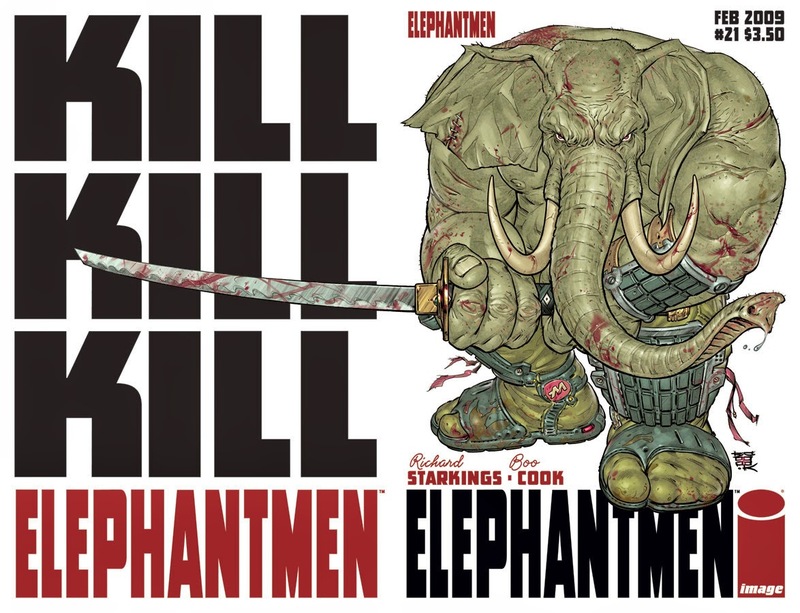 Consequently, I finally started to read the Elephantmen comic book series. This story is set several hundred years from the present in a dystopian corporate controlled future where the animals of Africa have been combined with human DNA to create intelligent, yet primal and instinct driven, killing machines. Elephantmen is brilliant. I do not give such accolades without much meditation and reflection; Elephantmen is that good. Moreover, I would rank it with Maus in terms of artistry, pathos, relevant social commentary, and storytelling. Elephantmen has brought me to tears. I say that not for effect: my observation is from the heart and without exaggeration. Politics, is at its core, about the management and control of resources. In order for elite actors (and others) to work their machinations over the people in a democratic polity, emotion and symbolism must be engaged and manipulated. Citizens across different arrangements of political society have a remarkably weak grasp on the specifics of public policy. However, they know how they feel about a given set of public policy issues. As world and American public opinion are being deftly manipulated by ISIS (or others who can use what are ostensibly the deeds being conducted by ISIS and its agents to advance some other party's strategic interests) it is extremely important to remind ourselves of the malleability of emotion and its role in politics. In all, emotion may be mobilized in one direction; rationality and cold calculus may be pulled in the opposite direction. Which pole and pull shall win? And are they that easily separated? As I shared some months ago, the movie Cloud Atlas--which was also on TV last evening--moved me to tears. Elephantmen has impacted me in the same way. Do share, what works of art, literature, fiction, or non-fiction, across mediums and genres, are guaranteed to produce a tear, or alternatively reduce you to a blubbering mess? The water out of your eyes is the result. Do also share, if you are so generous, why said example(s) makes you feel such a way? Movies and print can move me to tears more so than real life. (That's bad, I know.) The last two things that have moved me to tears are Blackwater's Youngest Victim and 5 Broken Cameras. Dystopias and sci-fis are my favorite genres. My recommendations for the year are Winter Soldier, Robocop (2014), Dawn of the Planet of the Apes and Divergent. We did catch Guardians of the Galaxy and while entertaining, didn't have much to tax the cerebellum. In a previous post, I mentioned the 1970 film "Little Big Man." I recently watched it again. I hadn't seen it since its original release. There is a scene where the U.S. cavalry slaughters a man's wife and children while he watches in shock. It is one of the most horrifying scenes I've ever seen. After the noise of gunshots and women and infants screaming, the soundtrack goes completely quiet. There is no sound. Much of the movie is satire: the sexually repressed reverend's wife (Faye Dunaway), the ignorant and vain General Custer (Richard Mulligan), and a snake oil salesman who gets tarred and feathered by an angry crowd. It's hilarious. But the director Arthur Penn refused to play genocide for laughs. When it comes time for the cavalry to do its dirty business, the film turns dead serious. I admit I cried. Did anyone have the misfortune of being belittled for crying while scared or hurt at a young age? I remember when I was taught to stop crying and it took a lot of time for me to try to embrace those emotions again. When I see someone in pain it usually brings a tear to my eyes... particularly over a lost loved one. On an unrelated note, I was doing a pre-assessment of adult ESL students and one told me he quit his job at a local casino because the whole system is racist. He told me this in Spanish, which I was able to understand a little bit. It was refreshing to hear someone, a stranger, say an institution and management is racist even though that has such a negative impact on others' lives. Apparently they make their Latino workers work only minimum wage jobs and no matter how much experience or how many years they work they don't increase their wages. I suppose there is always someone ready to take their job if they put up much of a fight over it, so many just stay at the same position working 50 hours a week to pay for rent and utilities. Picasso's Guernica. I can't really say why. I don't know why. More to the point, I don't think I want to know why. Knowing would ruin the mystery. 1970s Westerns were a response to Vietnam and American malaise. So much good film-making in that period. I finally saw The Shootist. I am going to have to track down a good copy of it on blu ray or dvd. Talk about a self-reflective, multilayered, revisionist take on the Western starring a dying John Wayne whose main character is also dying of cancer. Damn. Probably true. I do not ever want to become so sophisticated that I lose my capacity for moral outrage. I think Richard Mulligan's portrayal of Custer was pure genius. It tool me about 3 seconds to get my answer: "Gandhi." Gandhi the man and activist is one of my childhood heroes (I was a bit precocious) and Sir Ben Kingsley became the man for the film. I know I cried at least twice and very likely did so twice more. It's still a hard film to watch because it's an emotional roller-coaster.